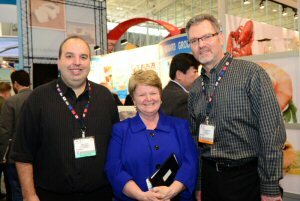 The Honourable Gail Shea, Minister of Fisheries and Oceans, is currently leading the Canadian delegation at the Seafood Expo North America. She is meeting with buyers, suppliers and exhibitors from across North America and the European Union. Minister Shea stopped to talk to British Columbia's Creative Salmon, the first farm-raised salmon producer in North America to achieve Canadian organic certification. "Creative Salmon is a leader in organic aquaculture," says Tim Rundle, Creative Salmon's General Manager, "and we are excited to be at Seafood Expo North America to share information about our unique product. Consumers are looking for organic seafood and Creative Salmon is proud to deliver a high-quality certified product backed by a made-in-Canada standard." "It is gratifying to visit one of the world's leading seafood expos and witness firsthand the positive reception that our seafood and our practices around seafood get," said Minister Shea. "Canada is recognized as a global leader, which is why we are such a big draw at this event." British Columbia is Canada's third largest exporter of fish and seafood, with exports valued at $903.7 million. British Columbia exported 159,395 tonnes of fish and seafood in 2013. The top three exports by value were farmed Atlantic salmon (38,804 t valued at $266.0 million), crab (6,178 t valued at $90.8 million) and hake (31,692 t valued at $61.5 million). For more information about Canada's fish and seafood industry visit our Web site. To view the photo associated with this press release, please visit the following link: http://media3.marketwire.com/docs/17E_F.jpg. March 16, 2014: The Honourable Gail Shea, Minister of Fisheries and Oceans, and British Columbia industry representatives from Creative Salmon at Seafood Expo North America. Left to right: Tim Rundle (General Manager), Minister Shea and Todd Waterfield (President).